James has a new light to help him see better in the dark. Push to see it light up. Inspired by the episode “James in the Dark” this new 2 -pack will make a perfect addition to any Thomas and Friends collection. Age grade 2 years and above. Anytime a train comes with a tender, that is just an added bonus for my daughter. 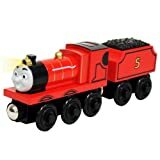 This James came with a tender AND a working light, so my two year old was very impressed. What Thomas collection is complete without James? He is hands down the coolest train on Sodor and every child who loves Thomas needs James. Nuff said.